Nor'easter brings surprise thundersnow to Philly area; did you hear it? 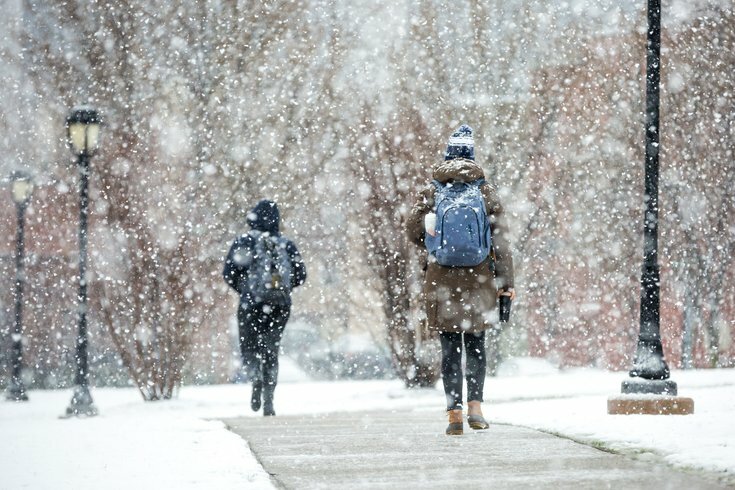 Students walk through Drexel Park in University City as heavy snow falls in the morning on Wednesday, March 7, 2018. After a sluggish start, Wednesday's nor'easter had finally brought a steady snowfall across the Philadelphia region by lunchtime and looked on pace to bring at least 8 inches of snow to the area by nightfall. The heavy, wet flakes, expected to create near-whiteout conditions in the city and suburbs at times during the day, are here. But thundersnow? Nah, didn't see that coming. Reports of the rare weather phenomenon from people along the I-95 corridor and in Philly and New York City began popping up on social media late Wednesday morning and were trending locally by the afternoon. Just experienced #THUNDERSNOW for the first time of my life and let me tell you it is everything I thought it could be. Finally just heard the 1st rumble of #thundersnow here in the far NE Philly! Weird! Its dumping big fat flakes and now #thundersnow in Philly #NorEaster2018. Kaboom! Did you hear that @JimCantore ?!?! Meteorologists said earlier Wednesday morning that thundersnow would be a possibility. As The Washington Post explains, thundersnow typically develops in quickly spinning nor'easters. Wednesday’s scenario is unique because the air at the mid-levels is so incredibly cold. That will enable the generation of “traditional” vertical instability, just like in the summertime. The result could be a spectacular — and unusual — light show in major metropolitan areas of the Northeast during the height of the storm. The National Weather Service Storm Prediction Center has included many Northeast cities in their thunderstorm outlook, a highly atypical move in the wintertime. Forecasters are calling for snowfall rates of 1-2 inches per hour to continue this afternoon.